Are we paying too much for concert tickets? Naturally, for an act as big as Lady Gaga, Metallica or (hate to say) Justin Bieber, you probably wouldn’t bat an eye after shelling out $70+ for a basic seat somewhere in the back of the building or arena. Of course, if you want to get much closer, you’re probably looking at the $200-300+ range and if you want to sit so close that you can actually touch Justin’s bowl-of-a-haircut, you’re looking in the $700-1000 range. Have these artists become so popular that the prices keep going up or is there something else at play? That question is hard to answer because there are so many factors involved. You have to consider the popularity of the artist, the location where they’re playing and their touring frequency. One fact that can determine your purchase price is who/where are you buying your tickets from. I guess not. Believe it or not, I can have a printed ticket mailed to my house via standard United States mail at no charge, but to PRINT the ticket on my OWN printer using my OWN ink and paper, it costs me $2.50! For this example, I won’t count the expedited shipping charges because these prices come from the shippers and have no bearing on the cost of the ticket unless you’re impatient and you want them faster. 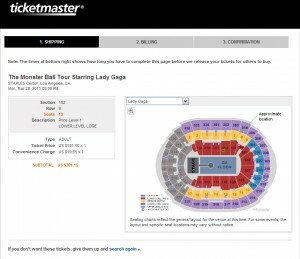 But I will mention that if you wanted to pick the tickets up at any local Ticketmaster location, it will cost you $3.00. Is it just me or does all that sound a little backward?! Wouldn’t it be more convenient to be able to print your ticket for free using your own supplies? 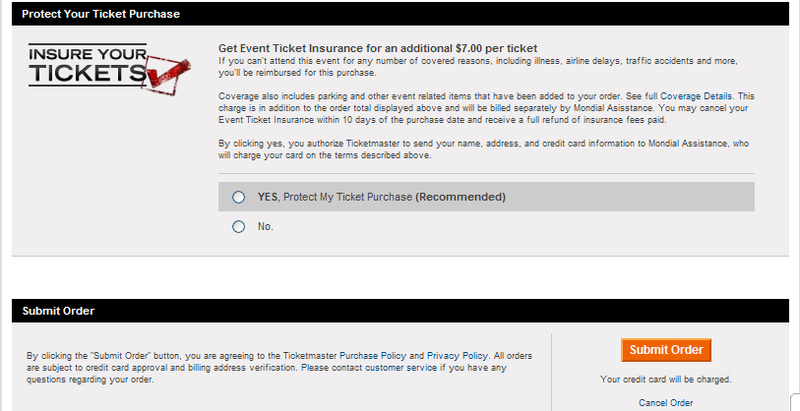 And why does Ticketmaster feel they need to charge $3.00 to say hi and hand a ticket to someone at a ticket counter? (Actually I’m told that if you want them to say hi, it’s another 25 cents.) And why do they not charge to print and mail a ticket via the Post Office? If I choose to, I can buy an exclusive t-shirt for $30 and parking in one of two Staples Center lots at $25 or $20—that is if I don’t want to try and find a cheaper (and likely less secure) parking lot further away from the building. 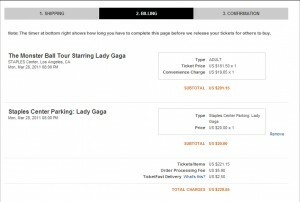 Since this article is simply based on ticket prices alone, we’ll skip past these charges and continue to the purchase page. Even though I didn’t included parking on the shopping cart, you can still get the overall idea of total cost. 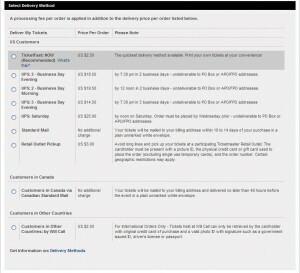 The last fee to be added is an order processing fee for: $5.90. What is this for?! 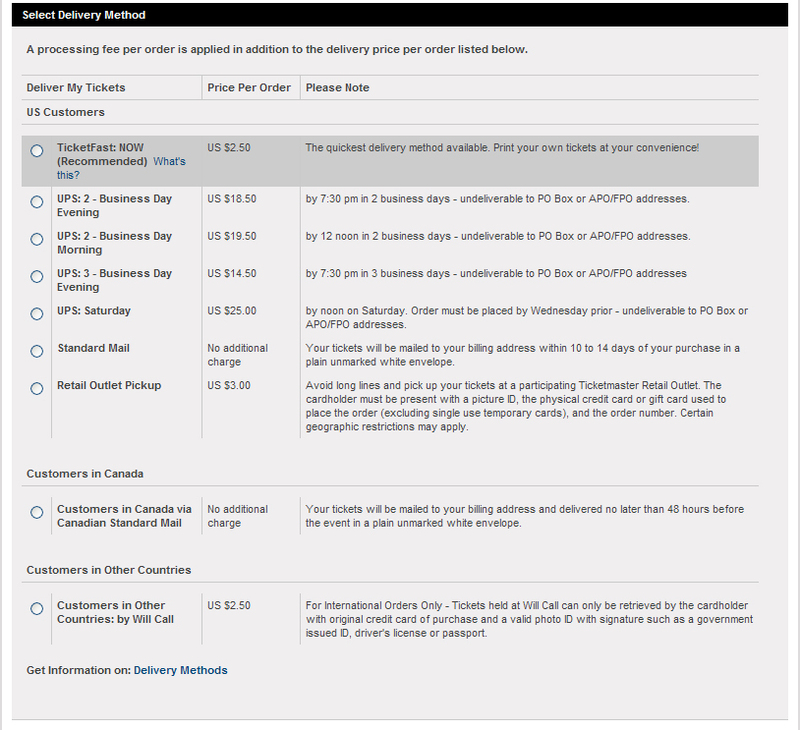 I thought the earlier convenience charge of $19.65 would cover the entire ordering process?? Nonetheless, it’s a fee that can’t be avoided. Remember, this is for just one ticket without parking, no souvenirs and no alcohol! And don’t get me wrong—I’m not inferring that Lady Gaga isn’t worth it (I wouldn’t know as I’ve never been to her concert. )—I’m just making a point here! There is a huge aftermarket for concert/event tickets on sites like StubHub, TicketsNow.com, TickCo.com, TicketsWizard.com and many more. Just go to any one of these sites and you’ll see the difference in prices! This is where the real mark-ups begin! 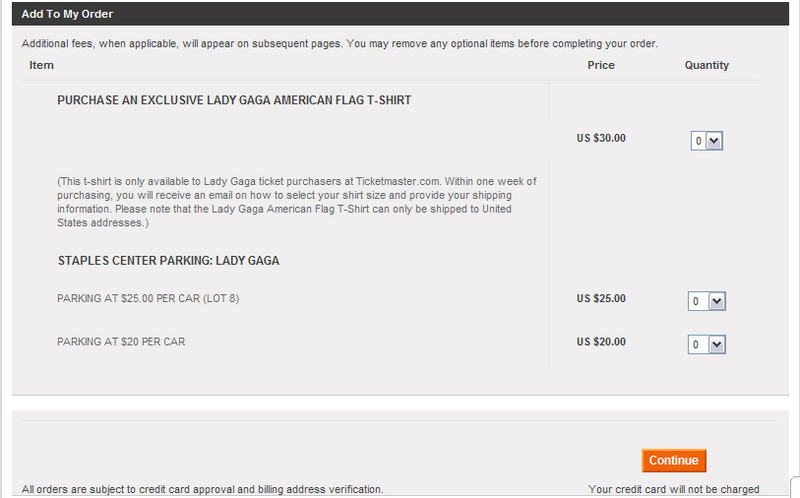 As a quick example, I went to StubHub and looked for a ticket in the same section as my ticket and would you believe it? 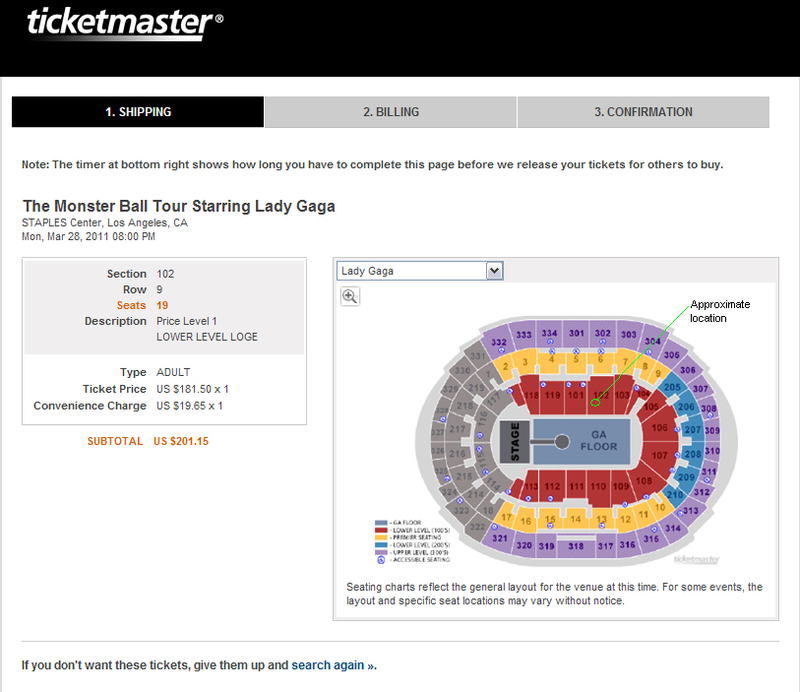 The concert is 7 months away and still not sold out, yet they are already selling same-section tickets for $237. 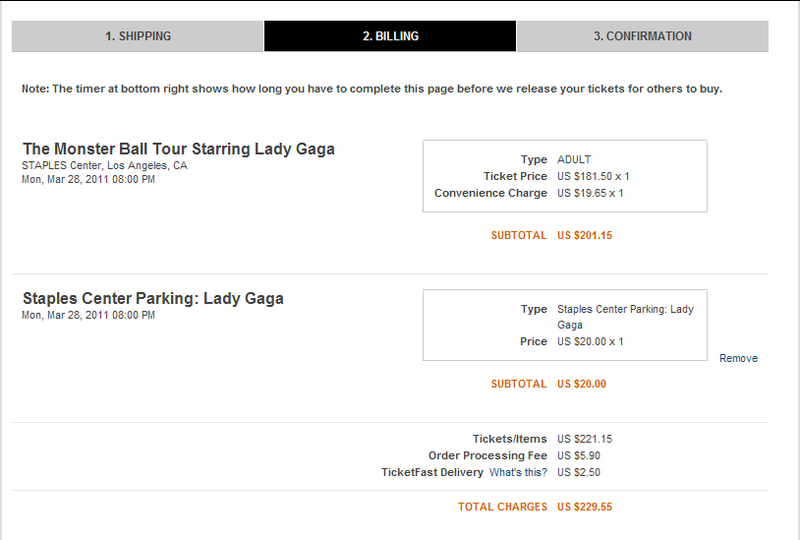 As you can imagine, these prices will only go up the closer the concert date comes. The only real advantage with these aftermarket sites is that you can generally pick your own seats whereas with Ticketmaster, you are stuck with what you get. Buying something for one price and selling it for another when demand is higher is not illegal and is generally considered a good business decision. But what about companies that buy up very large amounts of tickets just to sell them at a 50%+ markup? Do you think it’s fair that you don’t even have a fighting chance to get a ticket at face value? Personally, I think buying tickets online is a great convenience and certainly worth the “fees” to not have to stand in a line for hours to buy a ticket at the door, but I am completely against ticket hoarders much like I’m also against domain hoarders. These people make it almost impossible to get tickets because they buy so many so fast. Plus, the venues, the artists, Ticketmaster and everyone else involved don’t want unsold tickets, so they will sell them to anyone with money. Every artist could do what Bob Dylan is doing and that is not allow any concert tickets to be purchased before the event. 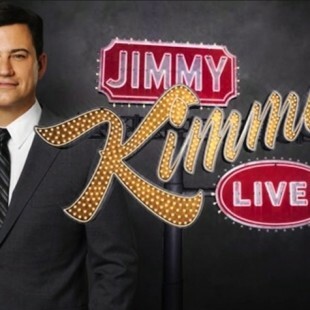 He decided that tickets for his next concert in San Francisco will only be available if you stand in line starting midday and purchase your ticket at the door. In addition, fans can only buy one ticket each which means your friends are standing in line with you. Oh and I almost forgot to mention, ticket sales are cash only! By doing this, Bob Dylan is single-handedly eliminating the over-inflated ticket prices found online, the ticket resellers on eBay (people who buy out-of-state event tickets just for resell), the “convenience” charges from Ticketmaster, the handling and order processing charges and the printing charges. Good job, Bob!! Of course doing it this way will most certainly cause many more problems–having that many people in lines all day holding cash, but I think it’s the only fair thing to do to ensure everyone has a fighting chance. Obviously this doesn’t stop people from scalping them, but because the tickets don’t go on sale until the day of the event, there will be no time for proper marketing and inflation. If every artist did this, maybe the tickets wouldn’t be so high and regular people can actually afford to go to high profile events. If it continues going down this road, eventually we’ll be accepting higher and higher ticket prices and before we know it, we’ll all be financing our next concert. If bands cared they would sell tickets through their website. But if a band plans a tour and those sites buy the tix, they do not have to worry about not selling out because Stubhub is who is taking the risk. The seats are paid for and no longer a concern. What bands could do is allow more tickets to be sold through them after signing up for a free concert fan club so there is a slim chance stub hub could buy them all. It`s hard to believe that scalping is actually a crime in some states and these companies can get away with robbing people. There should be a 10% limit above face vale limit on the 2nd hand market until the day of show, then they can jack it up to what they want.